I asked my colleagues to join me in a "no plastic challenge"
I really hate plastic. I hate that it’s made with oil. I hate that it mischievously floats around in the world’s oceans, and I HATE that it’s often ingested by unknowing marine and land animals. It’s why I feel dutifully bound to recycling, and it’s why I was eager to read Joe McCarthy’s informative piece about recycling. Joe’s title promised to provide me with simple recycling rules to live by, and I was prepared to live by all of them—especially rules regarding the use of plastic. Bye, plastic? But Joe, I’m typing on a plastic keyboard! Okay, to be fair, he didn’t exactly purport that it was possible to remove all plastic from each and every daily ritual—but how interesting would a “no plastic challenge” be? So I accepted this challenge. And I took it one step further—I asked the Global Citizen content team to join this challenge with me. For one week, we all agreed to stop using plastic. And you know what’s great about asking fellow writers to join a challenge? They’re really good at articulating what happened. They even surprised me with individual “plastic diaries." I invite you to read through these diaries (exciting, right?) and discover what we learned during our semi-successful journey to live our lives completely free of plastic. Nicki’s plastic diary: I preordered my salad online and it came in a plastic container unbeknownst to me! Oh NO. Passed up on the plastic cutlery though. Gus’s plastic diary: I ate one (or two, I can’t remember) individually packaged granola bars. I feel like it’s counterproductive eating organically and sustainably grown granola bars if they’re going to be wrapped in plastic. And for lunch I had sushi. It was imprisoned in plastic, like Magneto in the end of the second X-Men movie--just biding its time until I cracked. It didn’t take long. And I’d do it again, too. 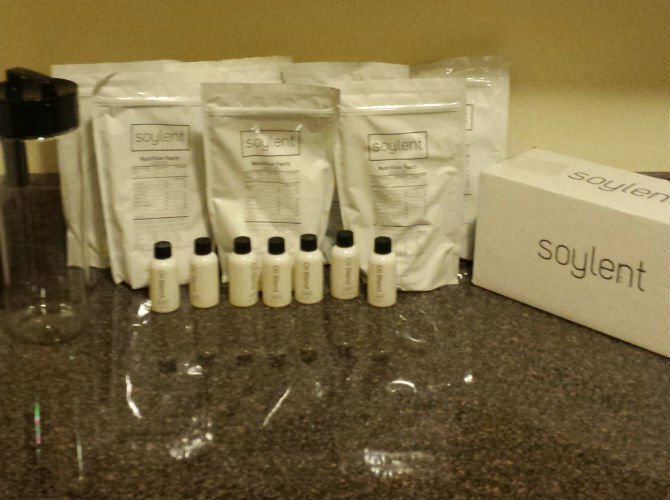 Joe’s plastic diary: Every day this week I cheated and plastic was somehow involved in my lunch: salad, Indian food from Whole Foods, peanut butter and banana sandwiches (saran wrap), soylent. And all my snacks had plastic, too: bars, nuts, bananas. 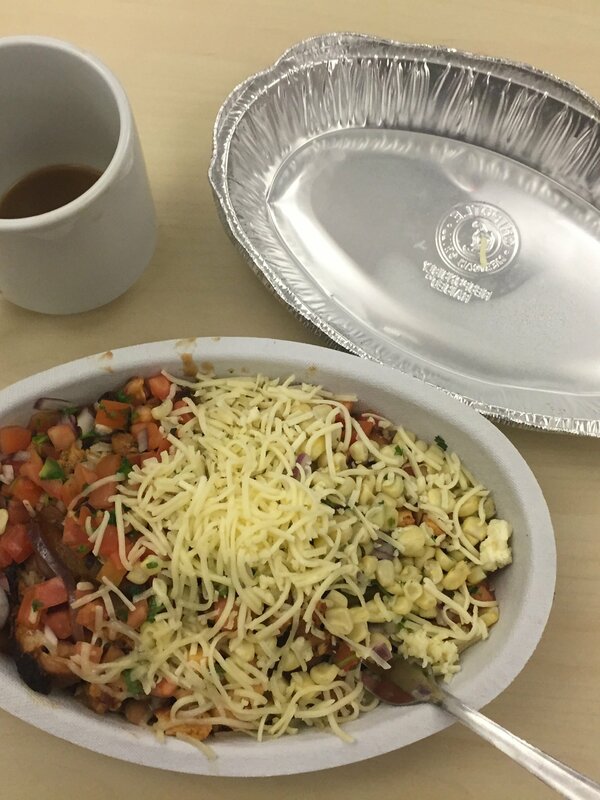 Caryn’s plastic diary: I succeeded in not using plastic all day thanks to Chipotle and my reusable grocery bag. 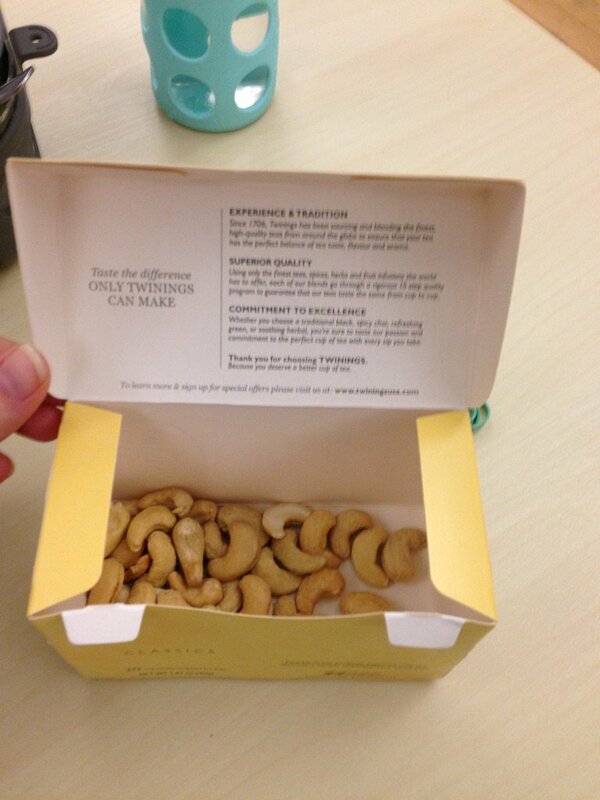 Although, I did eat a couple of almonds from a plastic container purchased last week. Does that count? Meghan’s plastic dairy: So close! 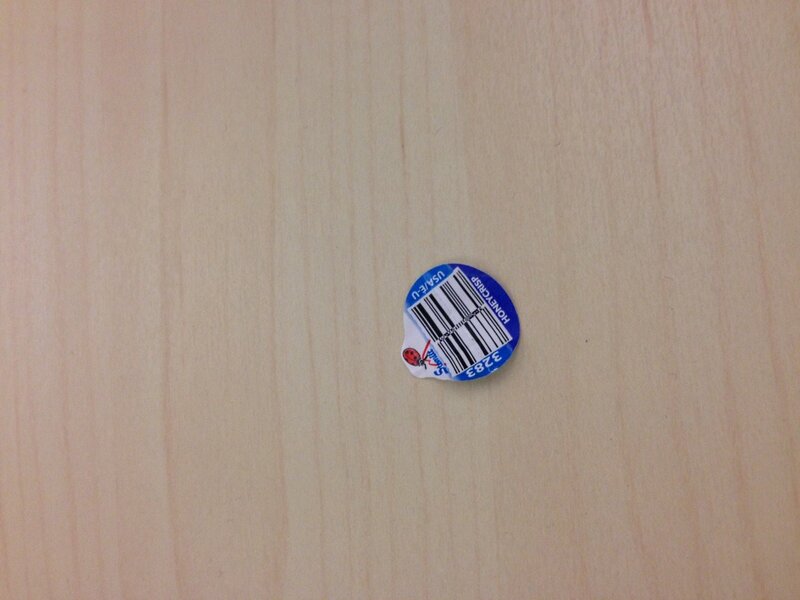 Had an apple with a plastic sticker, ugh microtrash. 2/ Avoiding plastic completely can feel nearly impossible. 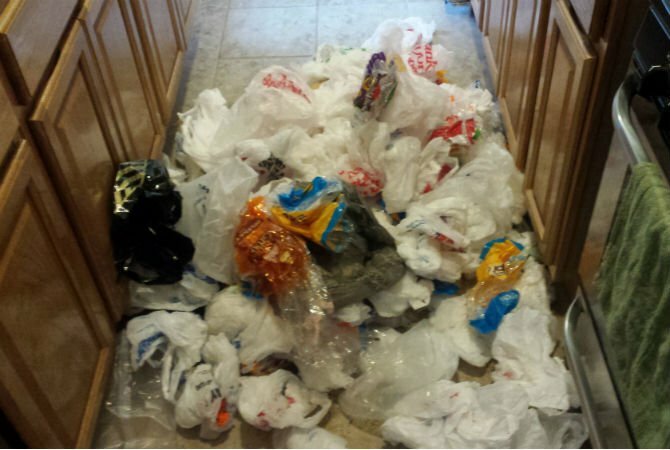 Nicki’s plastic diary: So, I failed the no plastic challenge in different ways every day. Even though I remembered to bring my own cloth tote to go grocery shopping, I still used plastic containers every day when cooking (spices come in plastic jars! eggs come in plastic cartons! ), showering, getting ready in the morning etc. 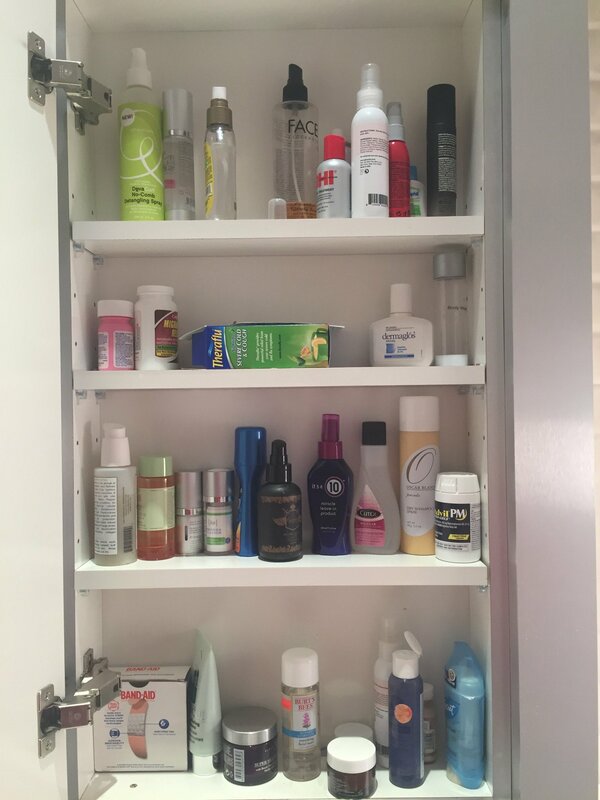 I mean, just take a look at my medicine cabinet...I don’t think there is one product in there that doesn’t involve plastic. Gus’s plastic diary: After my bathroom routine, in hindsight it seems I’m obsessed with plastic. (toothbrush, toothpaste, shampoo and conditioner, etc. exclusively contained in plastic.) Seriously considering more traditional forms of hygiene. I don’t know, instead of using shampoo, maybe I’ll go down to the river and beat my hair with rocks. I’m not sure yet. Joe’s plastic diary: Plastic is inescapable. Unless you have no job and no obligations and live in nature and never have to consume calories and have no desire to do anything, good luck trying to avoid it. Having a job in the city, commuting to that job and taking care of adult things leaves you with little time and energy to get rid of plastic. It’s a noble goal that people should strive toward, but ending humanity’s addiction to plastic is going to have to be a top-down kind of thing: laws have to be passed that strictly limit what kinds of plastics can be used and when so that everything we encounter in our daily lives isn’t swathed in it. Until then, I probably won’t be able to ladle my almond milk from a vat into a mason jar from home. Caryn’s plastic diary: I almost passed up a Tim Tam because they come in a plastic container. But it’s a freaking TIM TAM. When’s the next time I’m going to get one of those? Meghan’s plastic diary: Showered this morning and the plastic situation was a different story than yesterday. Plastic shampoo, conditioner, toothbrush, hairdryer, razor. Also listened to a podcast this morning on the train and noticed my headphones are plastic. Hans’s plastic diary: I've got a bone to pick with whoever decided to wrap my store-bought bread in not one, but two separate layers of plastic. Two! I'm not sure if all brands do this, but the loaf I opened came encased in a thin plastic film underneath the usual loaf-shaped bag. Feels like overkill to me. I'm all for preserving freshness but, man, they might as well go all the way and individually wrap each slice. 3/ However, a little planning and preparation can go a long way. Nicki’s plastic diary: Participating in this challenge reminded me of a documentary I saw a few years ago called “No Impact Man” about an NYC resident who tried to have ZERO carbon footprint for a year. No products, no mass transportation, no electric devices...NOTHING. It was tough, but he was able to do it (and his wife and kid!). His example is an extreme one (check out the trailer below...he also has a book “No Impact Man the adventures of a guilty liberal who attempts to save the planet and the discoveries he makes about himself and our way of life in the process”) but it proves that if you take the time to plan for that type of commitment it’s doable. I felt a lack of planning (not bringing a non plastic container to transport things, for example) was responsible for a lot of my failures. Gus’s plastic diary: I ate more granola bars. I’m not proud of it but I did it. I keep catching the light glint off the inside of the wrapping as it sits in the garbage can out of the corner of my eye. I think it’s staring at me. Caryn’s plastic diary: The city lifestyle is definitely not conducive to living a life without plastic. I swear I used to love to cook, but in New York CIty, I find myself ordering takeout more than ever. This challenge really forced me to plan out my meals every day, and you know what? I actually ate a lot healthier. I ate more vegetables, and I purchased less meat (the only meat I could buy was the more expensive paper-wrapped meat from the butcher). 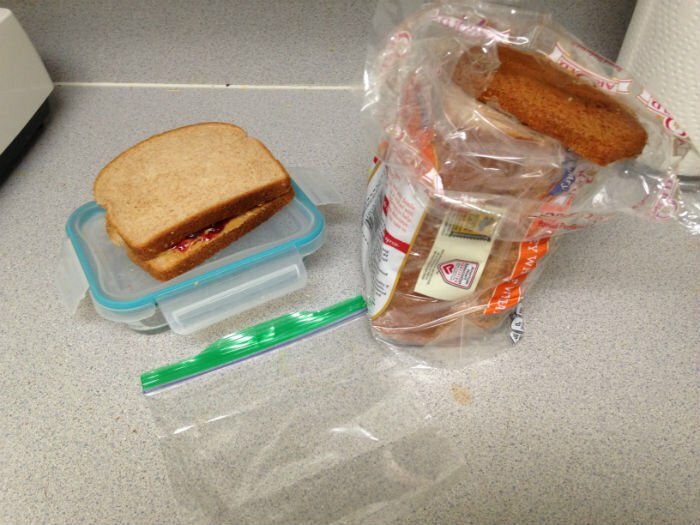 Hans’s plastic diary: I'm an avid lunch-packer, and one of my staples is a good old-fashioned peanut butter and jelly sandwich (I'll be the first to admit I have the culinary range of a third-grader, but those things are easy, filling, and cheap!). Anyhow, my no-plastic challenge got off to a rocky start when I remembered I couldn't pack my go-to sandwich in the usual plastic baggie. Luckily, I happened to have a sandwich-sized glass container on hand—yes, the lid is plastic, but it was either that or go to work clutching the sandwich in my bare hands and dripping jelly everywhere. Not an option. Anyhow, I found my (mostly) plastic-free workaround and still managed to enjoy my PB&J at work. Everybody wins! To make a long (yet entertaining) story short, completely erasing plastic from your life is nearly impossible. And trying to do so could be compared to going on a crash diet that will only make you irritable, weak, and hungry. Basically, it’s bound to fail and could potentially result in a full-blown plastic binge. To make a more sustainable change in your life, start small. Begin by incorporating reusable items into your daily routine (e.g., stainless steel water bottles, cloth grocery bags, glass tupperware). Then once you’ve got that down, try purchasing groceries that aren’t completely “imprisoned” (as Gus likes to call it) in plastic. You might be surprised by how much healthier your meals become. Eventually, you may even get to a place where you’ve removed most single-use plastics from your life. The bottom line is that Joe is right. If there’s going to be a big change, corporations need to start using more sustainable materials. Global citizens should definitely advocate for that, but until that happens, it’s on us to be more conscious consumers. It may take a little bit of patience and preparation, but significantly limiting your plastic intake is certainly possible. And it might even be a little bit of fun. You can also save the environment by using your voice. Call on leaders to shift our societies and economies to 100 percent clean energy in TAKE ACTION NOW.